What's worse than a missing man? Following a messy divorce and the messier death of his partner, Detective Frank Luca needed a break. He needed sunlight and clean air. He needed a re-boot. So, he's traded the smog of New Jersey for the sun-kissed beaches of southwest Florida. Babes, bikinis, and booze. The easy life, right? Wrong. Working a missing persons case, Frank gets pulled back into the filth he's tried so hard to avoid. Worse, now he's falling for the missing man's beautiful wife. Florida may be beautiful, but its beauty is only skin deep. There's rot underall that beauty--and death. 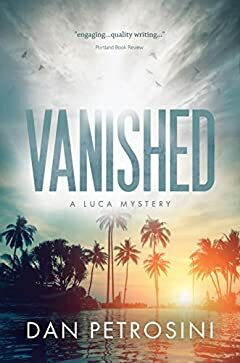 Jammed with betrayal, tension, and suspense, Vanished is the second novel in the Luca Mystery series. You'll love this noir-heavy detective story for its character, grit, and mystery. Detective Frank Luca is back in another hard-boiled mystery. Grab this stand-alone novel now.